Cook outside. Whether you have a charcoal or gas grill – or maybe you have an electric grill that you can plug in on your back patio (like the George Foreman grill), cooking outside keeps the heat associated with cooking out of your house. This, in turn, minimizes the work load on you’re a/c – and can reduce your bill. A quick Google search will provide you with jillions of recipes and cooking tips! Raise the temperature of your house while you are away. This does not mean turn off you’re a/c– but if you know your house will be empty from 8AM until 3PM, raise the temperature a couple of degrees (doing much more than a couple of degrees may cause problems) as you walk out the door, and lower it back to your standard temp when you return. If you are able, consider installing a blackout curtain or shade over your windows – especially the windows that face the sun in the afternoon. This not only helps with minimizing the heat seeping in from the sun, it also makes for a wonderful, dark room at night – which can help you get a good night sleep! Have other ideas for us? Please share them!! 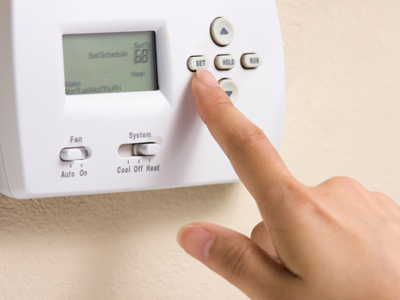 Optimizing the temperature in your house is key to energy efficiency. Grilling outside makes perfect sense in order to prevent unnecessary heat addition to your house when cooking inside. The extra heat inside your house will take make work from the air conditioner to over come, which will then add up to more cost each month. I could try to raise the temperature when my room is going to be unoccupied for a while. I like that it would also be eco-friendly. Its just one small, green step that could help save some green during the Southern summers. I might even grill a little or get blackout curtains. For someone who lives in the south during the summer this is a very helpful tool. Although some people may not feel comfortable raising the temperature of their homes while not at home, blacking out windows seems like a smart way to block some heat while saving money. If you constantly have to run the A/C then you just need to accept the fact that you will continuously run up your electric bill. There are many remedies to save money during summer in the south but these key features are a great start. It is great to have someone post about summer savings that understands the very unique problems living in the deep south can pose. I never knew that cooking outside could save someone money. That is definitely something that I will incorporate in my life more. I actually already change the temperature in my house when I leave for extended periods of time, but sometimes in the summer that just is never a pleasant option. I am glad the black out shades/curtains were mentioned. I have always had them in my house for privacy and to keep out the light when needed, but I never considered them for keeping the heat out. It is very cool to know that my shades/curtains help me save money! I think these are great ways to save money in the summer. Cooking outside on a grill will not only save you money, but it will also help you get healthier. Grilled foods are delicious and good for you. Raising the temperature of your home while you are not home during the day makes sense. If you aren’t there, then there is no need to keep it as cool as you when are home. Electricity bills are very expensive during the summer months so I will definitely try it out this summer. Blackout curtains are great. I have them in one of my rooms and they really do keep the room cooler. This author was on point when he said that the usual summer a/c tips are “absurd” for those who live in the south. I completely agree with utilizing window shades, and even as Steve mentions below, using fans. Also, cooking outside is the essence of southern (Louisiana in particular) living. Who could imagine life without tailgate, crawfish boil, and jambalaya mixers outdoors. However, there is one item that I find to be a crucial component in keeping cool and money– TREES. Having a tree can offer valuable shade that can shelter your home from the sun’s scorching rays. Aside from offering reprieve from the heat, a well picked and positioned tree can add value to your home giving you more bang for your buck. Therefore, I urge everyone to go green and plant a tree. It will be worth it. Summer electricity bills in the south can be extremely expensive. In addition to the ideas of the author, one might want to try the use of ceiling fans or other fans, if they do not have a ceiling fan. Often times, with the use of a fan, one can adjust the thermostat a bit higher, while still be very comfortable. I agree. Turning the A/C up a few degrees during the summer when I go out lowers my electric bill and I have black out curtains that I love. Great for sleeping in and when the sun is beaming in. Having lived in the deep south my entire life i can definitely see how some of the yankee summer savings ideas can be utterly useless to the residents of the deep south. Not only is cooking outside a way to save money by lowering your gas bill but when the mosquitos aren’t eating you alive it can also be a fun get together with neighbors and a great way to spend time with family. Saving money while upping your thermostat a few degrees or even turning it off while your away can save you tons of money in the long run. The problem with this is when you arrive home you have to have the control not to crank the AC all the way down to 60 degrees to cool down as fast as possible. You have to understand an air-conditioning unit can only lower the interior temperature so much below the exterior temperature. Installing an thermostat that has a time setting function is extremely beneficial to cutting cost with your A/C when your not at home. I agree with many of the things the author says. Though I believe it is important to be cost-efficient and save energy, summer in the South can get hot enough to cause severe health problems, which is why I agree keeping the AC up a few degrees and using dark shades. As the poster Douglas said above me, when it gets too hot and health concerns become a real issue, being cost-efficient is not the most important thing on my mind. Summer in the south can be brutal, on both your wallet and your body. Turning the air off while you are not at home and putting shades over your window can be really cost effective. Saving money is important, but only to a certain point. When temperatures reach triple digits, saving money isn’t at the top of your list.